Who was George Lane? 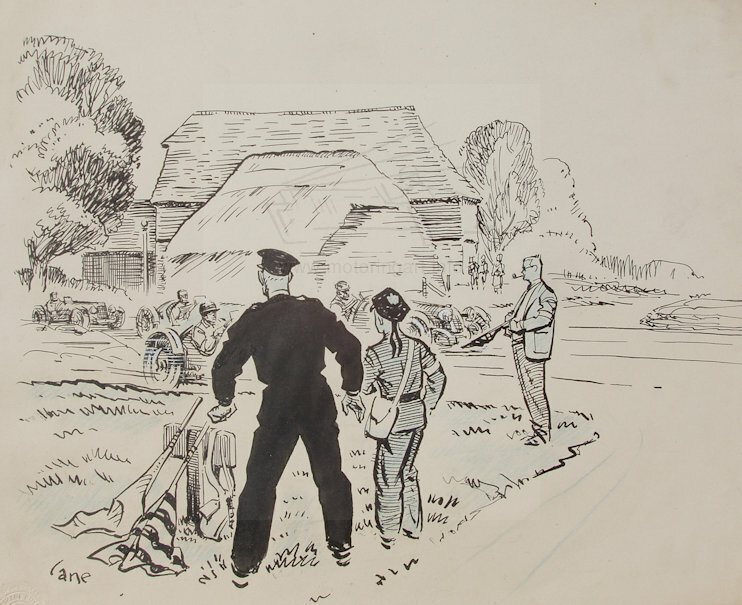 He was definitely the unsung hero of The Motor magazine providing large numbers of illustrations and to a large extent kept them going through the Second World War with illustrations and retrospective art about earlier motor races. In December 2016 there was a small archive of his art in auction at Reeman Dansie Auctioneers in Colchester. It was said that the artwork was consigned by his daughter Jenny Lane living in the Colchester area. Unfortunately attempts via the auctioneer sending stamped addressed envelopes failed to produce any response from the daughter. The auctioneer had managed to gather some information about him which was used as an introduction to the archive and I quote from the catalogue. ‘George Lane trained at The Slade and The Royal College of Art. 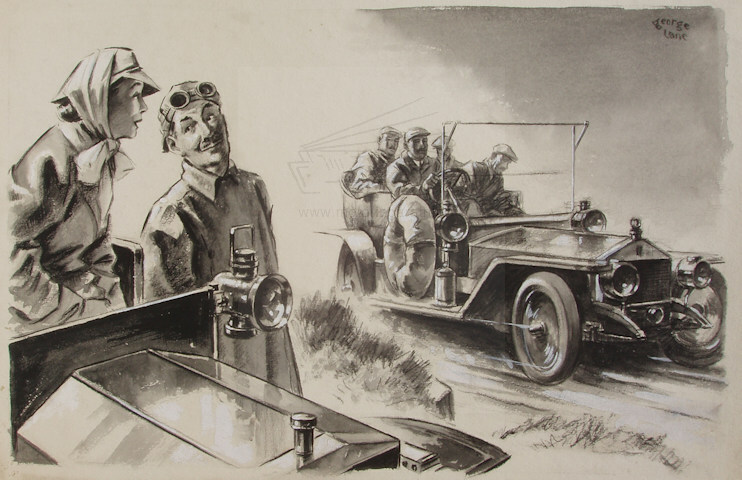 During the 1930s and 40s he quickly established himself as an illustrator working principally for magazines including The Autocar, The Motor and Aeroplane. He also illustrated children’s books, was a prolific book cover illustrator and even had a spell post War working with The Eagle. During World War II he assisted the war effort as an ambulance driver. 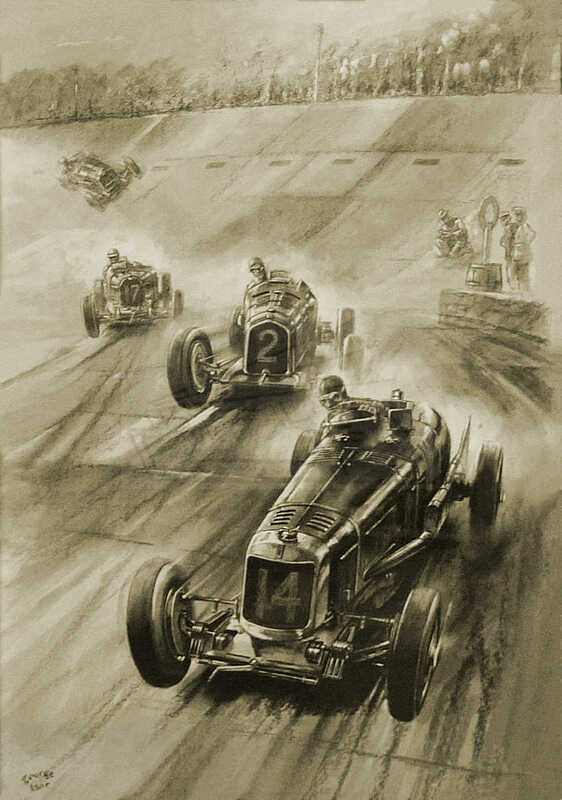 ‘ The first George Lane art I have seen starts in the mid 1930’s in Motor Sport and Speed magazine. By the war years he was working for The Motor where he was probably a staff artist. By the way George Lane worked for The Motor it can probably be assumed that he was unfit or too old for active service. The few people that could recall meeting him knew him as ‘old’ George Lane. From another contact Mike Tilyard, who knew George Lane and his daughter Jenny it is estimated that George was born circa 1904. George Lane and Mike’s father Sid Tilyard were great friends prior to and during the War. At that time Mike and Jenny were about 10 years old, Sid being the landlord of the Abingdon Arms in Kensington. George and his wife Bris, had a basement flat in Nevern Square just off the Earls Court Road. 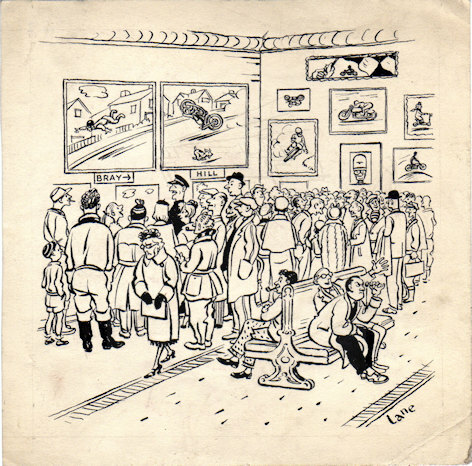 George Lane was a master of black and white illustration using various techniques such as pencil, charcoal, gouache or pen and ink, often using the different media in combination. His use of colour was very limited and watercolours and an oil painting have been seen. 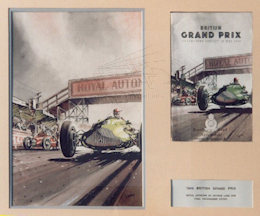 An early colour work noted is the front cover design for the 1949 British Grand Prix at Silverstone where The Motor using George Lane provided the artwork. 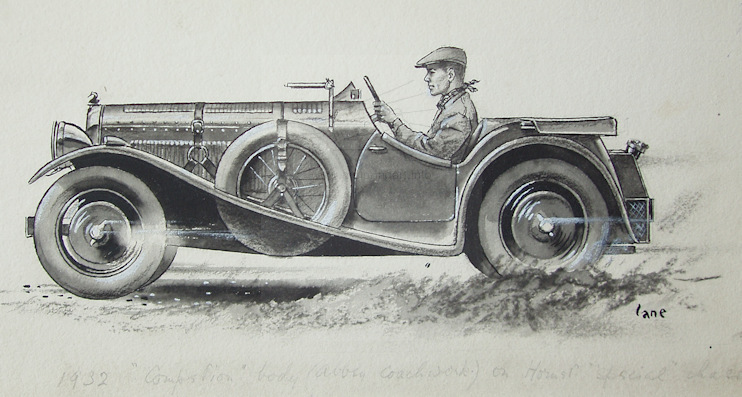 The original for this exists in the collection of the Royal Automobile Club. 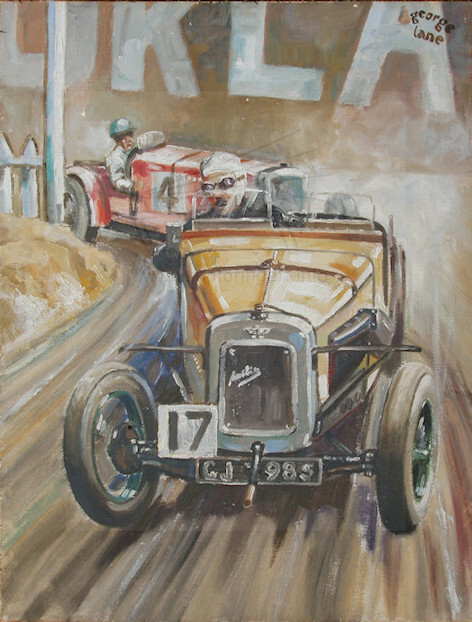 Subsequently I found the oil on board of an Austin 7 racing at Brooklands (illustrated). This painting has the feel of something completed in later life, rather than contemporary pre-war art. 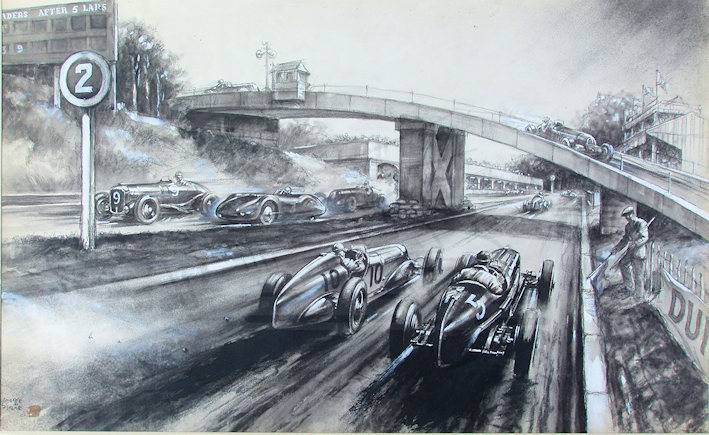 The subject of his art varies considerably from studies of Grand Prix racing, veteran cars, current road vehicles, story illustrations, industrial scenes, caricatures and cartoons. 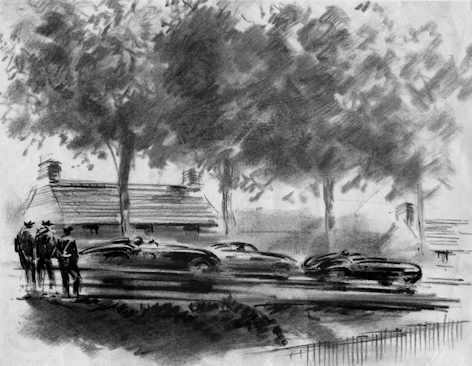 The styles of his art can change from stark contrast pen work to very soft charcoal very reminiscent of Frank Wootton. Wootton and Lane both worked at The Motor at the same time so it is not surprising that there may have been some influence. George Lane’s art tended to be fairly small in size on cartridge paper or art board less than 12 inches square and is simply signed ‘Lane’ or the smaller studies are just initialled ‘gl’. Unfortunately quite a lot of studies are unsigned this is particularly true where he was doing a composite illustration of several sketches, only one of them would be signed. 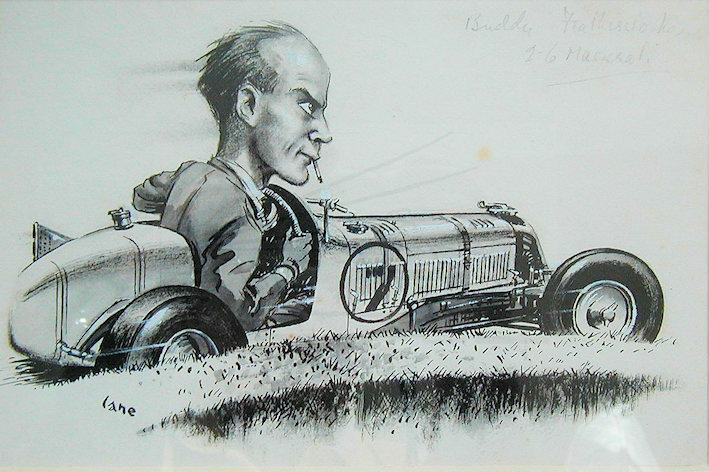 We are fortunate that there are quite a lot of his original works survive, many came to the market with the sale of The Motor and Autocar archives in 2001 plus the small archive in the Reeman Dancie sale. This work is only a small part of his output as the list referenced on the Bearalley website of his book illustrations indicate. 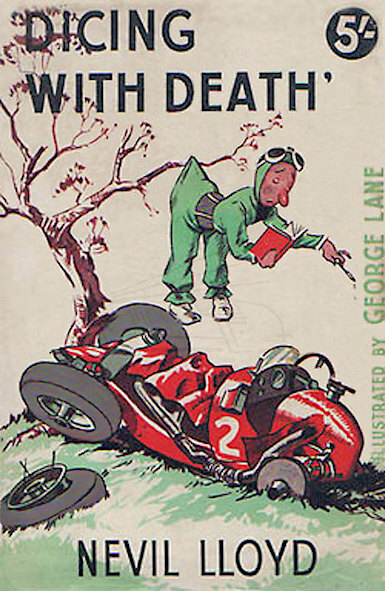 It is a great tragedy that we know so little about George Lane who was an extremely competent artist and accurately recorded an important time in motoring history. 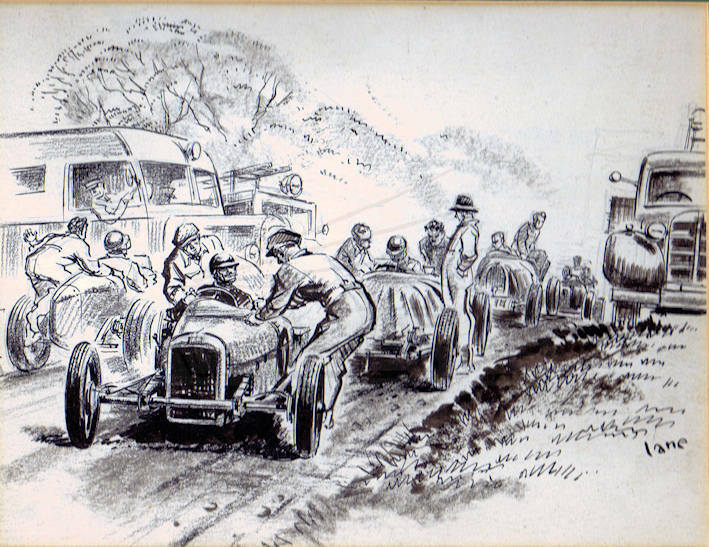 It is hoped that readers will be able to contribute more details about George Lane’s life so we have a fuller picture of this important motoring artist. Austin 7 racing at Brooklands. Unusual oil on board. 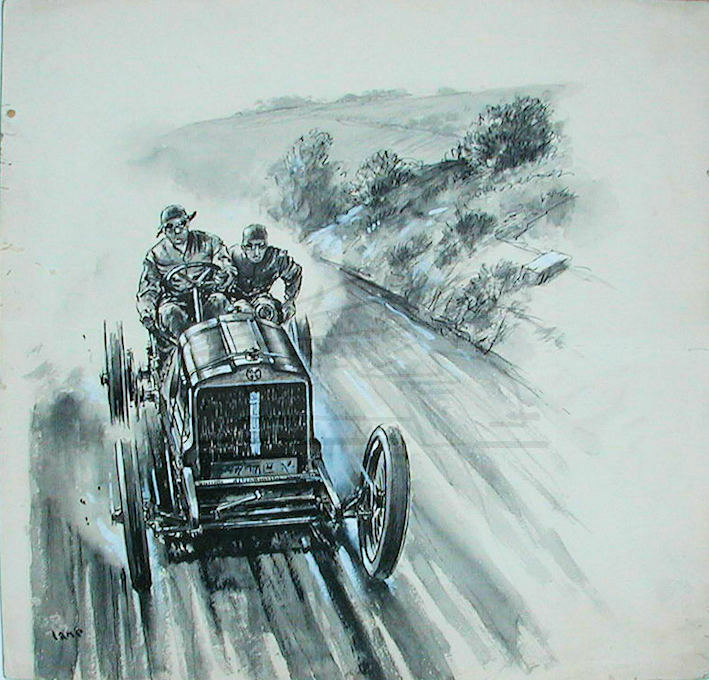 Lane's war-time view of the appearance of motor racing after the war. Features famous pre-war cars. 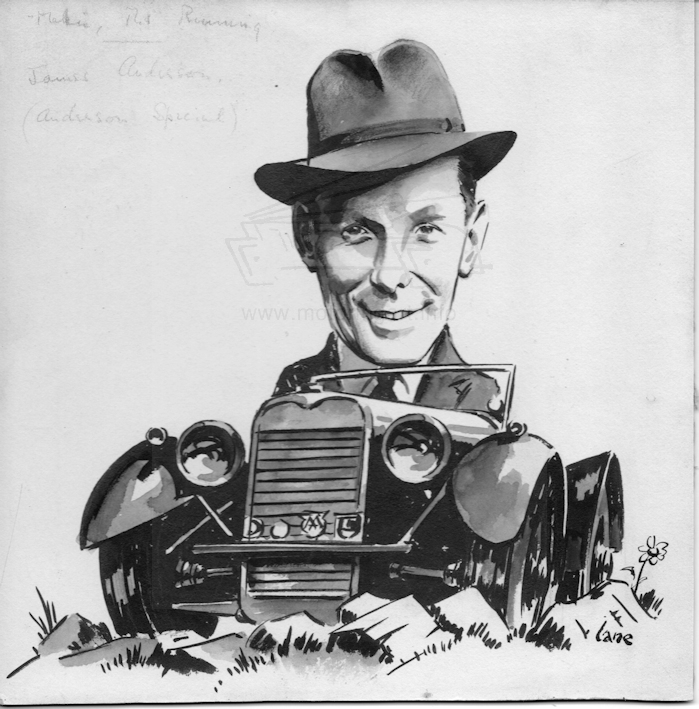 Caricature of James Anderson with his Anderson Special trials car. 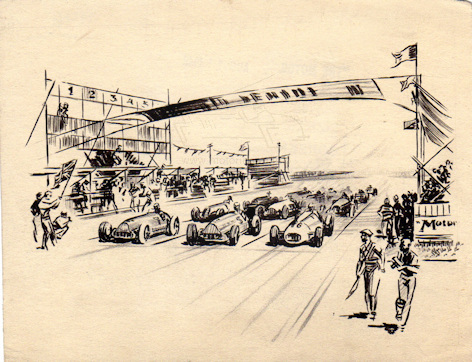 Start of a British Grand Prix immediately post-war. Le Mans 1958 with Jaguar, Ferrari and Aston Martin cars. Cover design for book Dicing With Death published January 1936. Image courtesy of Stuart Middlemiss.